THE BEE VOLUME BOOK, containing "imposter bee" specimen, was created as a performance prop to house THE BEE VOLUME poems. THOUGHT-FORM DOILY NO. 11: RADIATING AFFECTION melds traditional floral motifs and floriographic meanings with abstract form and colors from the thought-form palette (presented in the 1901 Theosophist book Thought-Forms) into a crochet hybrid that breaks from the conventional circle into a free-form thought-form. The specific color of the thread, hand dyed using plants and flowers, represents affection in floriography and Theosophy. 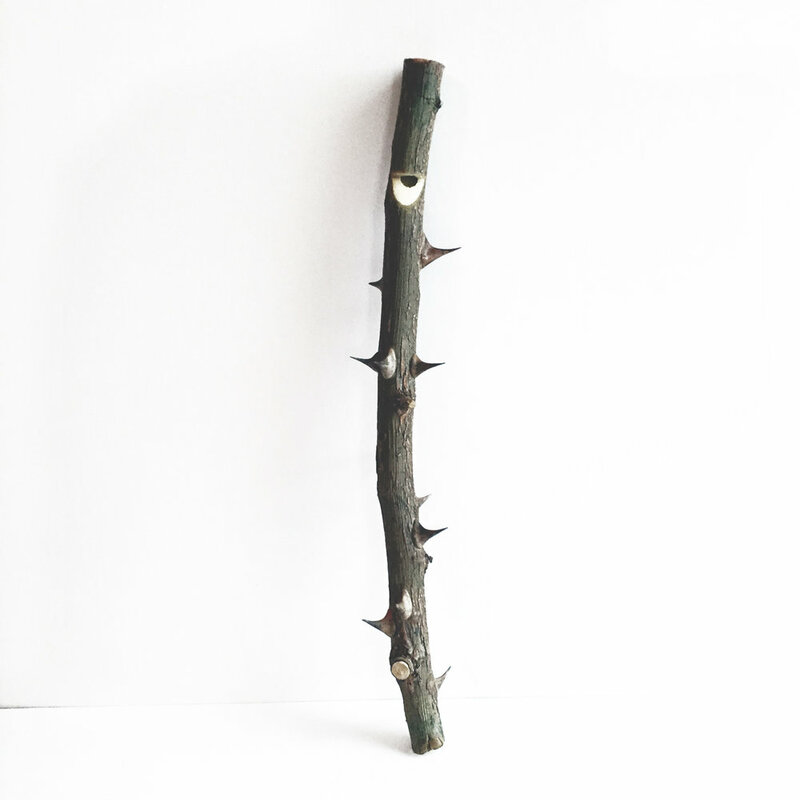 ROSE WHISTLE, made from a rose branch and played on the FLORIOSOPHY song O Rose, Thy Heal The Sick. FLORIOSOPHY is a program of original songs and interpretations of Victorian ballads and a Theosophist composition performed on horse-hair fiddle and voice. Each song transmits the emotional energy of specific flowers or plants according to floriographic interpretations. LURID DREAMS IN 5 DAYS Each clock has been reconfigured to contain an original poem which cycles in 1, 5 or 10 minutes. The collection forms a book reflecting on death and the subconscious. 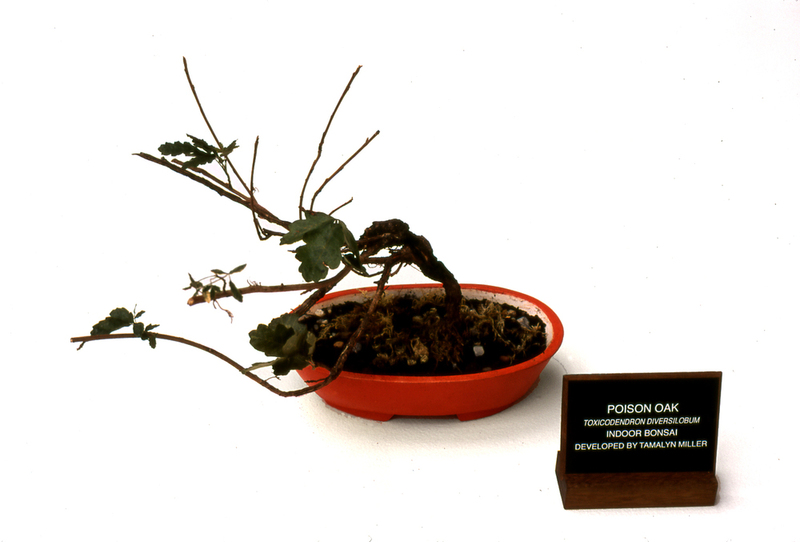 POISON OAK BONSAI Twisting a classical symbol of cultivated beauty, Poison Oak Bonsai grows in a container painted with ground cinnabar, a dangerous, but beautiful mercuric compound that was used in Chinese alchemic elixirs and painting. POISON OAK PAPER Two sheets of 16" x 22" paper made entirely of poison oak leaves printed with original poems on the relationship between beauty, pain and creativity. POISON OAK PAPER detail: The irritated hand / writes. This is not art. This is the harvest. BRUISE HAMMER A cast hammer with raised fleur-de-lis motif for producing decorative bruises. VEGETAL MAP OF THE UNDERWORLD Cut and flattened to resemble an ancient map, a pomegranate rind is painted with miniature botanical studies of plants reputedly found in the Greek underworld: Mistletoe, Asphodel, Cypress, White Poplar, Narcissus, Pomegranate Seeds. NAIL FETISH subverts a domestic icon of decoration and protection, a crocheted doily, with the addition of cat claws, a reference to the witches’ familiar. THE GLOVE IS THE MASK OF THE HAND A feathered glove with elastic strap that "masks" the palm of the hand. Part of an ongoing series HOW TO SEW A GLOVE, a collection of hand-made conceptual gloves, each accompanied by an original poem. STIGMATA GLOVE It is enough to dream of stigmata / in the morning, there will be bloody hands somewhere. FLYING OINTMENT: MANDRAKE Five hand-made, left-handed gloves embroidered with images of hallucinogenic herbs including Henbane, Belladonna and Monkshood that were reportedly used in witches’ flying ointments. FLYING OINTMENT: HEMLOCK A commentary on women's power, the gloves are made of cheap muslin fabric but are preserved in glass-fronted boxes that are lined with silk. THE PALM OBSERVERS THE EYE DETERS displayed on a mirrored platform for extra protection. DEXATRIM CANDY NECKLACE Produced in conjunction with the GALA Committee for In the Name of the Place, a collaborative art intervention that inserted conceptual works into the sets of the Melrose Place television show. INFECTIOUS CLOCK The numbers on this clock are replaced by images of microorganisms that cause major diseases such as tuberculosis and diphtheria which are making a comeback after having been largely eliminated. Produced in conjunction with the GALA Committee for In the Name of the Place, a collaborative art intervention that inserted conceptual works into the sets of the Melrose Place television show. CONDOLENCE BELT With cigarette filters substituted for shell beads, this hand-woven belt is patterned after an Iroquois wampum belt that was used to express condolence. ABACUSThe egg "beads" on this one-row abacus are embellished with graphite drawings of hybrid transformational symbols from various cultures, suggesting an alternative approach to mathematical certainty. PERSEPHONE The miniature painting inside a pomegranate illustrates the mythological cycle with wheat and the winter-blooming (and poisonous) hellebore.